The North-eastern hilly state of Tripura has a rich tradition of art, crafts, textiles, architecture, sculpture and many other artistic pursuits. Brimming with artistic excellence, this Indian state has carved a niche for itself by virtue of its bamboo and cane works, which form one of the most significant craft forms exhibited by the state. Tripura has pursued its bamboo works to such a serious extent that in gaining excellence in the field, it conducts serious research in the chemical treatments of bamboo. Various courses are offered in bamboo work so that people gain expertise and can take the state a step further towards its cultural feat. While common items like bags, mats, vases, fruit baskets, lamp shades and dining mats are made of bamboo, one would also find huge structures are built in the plain land of Tripura where bamboo is the chief material. Such large structures can be shops, workplaces, houses, granaries and at times, big warehouses! Such lightweight constructions can easily withstand quite a number of earthquakes at a time and can also resist the powerful winds. Bamboo screens are widely available in Tripura which the state specializes in weaving, the level of excellence being such that the output resembles ivory! Colorful bamboo chips are often used for doing delicate appliqué work on such screens. Tripura’s bamboo culture spreads even in the making of whistles and smoking pipes. Bamboo whistles are made from the small diameter culms. When blown, such a whistle produces a shrill sound. The Riang tribe uses a large hookah for smoking tobacco. It is made of three parts. The clay bowl gets connected to the water container by a small bamboo tube. The container is considerably big diameter culm. The short bamboo tube which is made from small diameter bamboo penetrates the container and finally ends in the water level. The other end has a clay bowl where the tobacco burns. One of the most prominent industries of Tripura is that of bamboo matting. Bamboo matting can be both sold being measured in the unit of meters and also in the form of certain products. The fine quality of the bamboo split would be the determining factor of the cost. In fact, to be more accurate, the width of the amts and also the number and color of the warp threads in the area of 25mm would determine the price. Other useful bamboo products found generously all over the states include fans, hand bags, lamp shades and a huge number of decorative items. Bamboo tablemats are extremely useful and at the same time attractive. These are woven on the loom. The mats of finer quality have greater labor charges. Some mats are made with such artistic excellence that those bear oil paintings by the indigenous artists of Tripura. Some more interesting products made of bamboo include trays and tea cozy. Circular and semi-circular fans are also produced using bamboo matting. The lampshades made out of bamboo matting look awesome especially when held against the light. The texture is so beautiful that one could hardly take one’s eyes off. Mugs, pencil holders and various other novelties are often fabricated from bamboo splints which are beautifully shaped. In Tripura, various types of houses are made of bamboo. The Riang tribes use bamboo as the primary material for building their houses. Instances of making thatched roofs out of bamboo leaves are also common. The houses thus made are perfect hill dwellings and are built on bamboo slits so that a horizontal platform can be created which acts as the floor of the house. For supporting the roof structure, quite a number of bamboo posts are extended above the surface of the floor platform. Structurally, a typical Riang house is long and rectangular where the verandah in front remains covered and the one at the back is left open. Between these verandahs, a huge room is enclosed. The use of bamboo is found in multifarious segments where field fence and house fence also do not get neglected. The plain land of Tripura would reveal abundance of open-type field fences which are made of longitudinal splits of bamboo where horizontal and vertical elements are interlaced and spaced accordingly. While keeping in mind the need for sturdiness and also optimum economic use of raw materials, a combination of a whole bamboo, longitudinal sections of bamboo and quarters and splits of lesser measurements are used. Posts are made by cutting bamboo culms into commensurate lengths and anchoring the same in the grounds. The houses in Tripura are often bounded by fences made of bamboo boards where the whole bamboo culms are flattened. The fences are generally closed and the bamboo boards are woven so closely that hardly there is any gap. Such fences are generally taller than humans and are supported by bamboo posts which remain anchored in the ground being spaced at regular intervals. With utmost care such fences are made which can stand all sorts of weather conditions seamlessly. A very significant area where bamboo is used copiously is the basket-making industry. 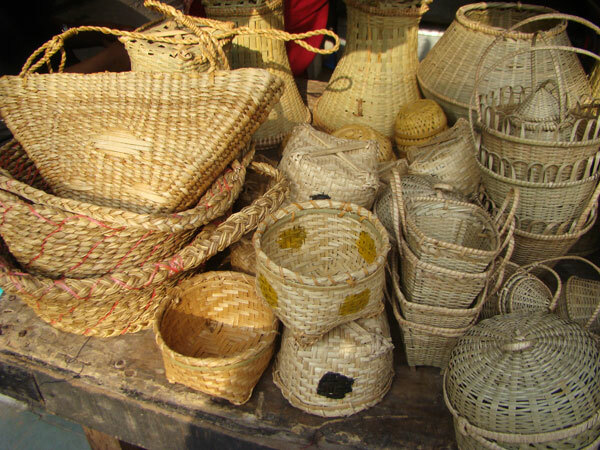 Tripura is famous for its bamboo and cane baskets. There can be a variety of such baskets, as discussed below. Open weave carrying baskets are made of the outer splits of bamboo. Such a basket is 7 mm in width and 1.5 mm in thickness. The other characteristics of the basket include a square base with diagonal 330 mm, rim diameter measuring 390 mm and height measuring 540 mm. the sides of the basket tend to narrow down into a waist and then it flares out to the rim. The Jamatia tribe of Tripura is mainly found to use such baskets widely. Closed weave carrying baskets mainly used by the Riang tribe for carrying grains. This kind of basket is used by both men and women in varied sizes. The baskets used by the women are relatively small. These are made of bamboo splits and meager amount of split cane is also found to be used for binding the baskets. The square base of such a basket has a diameter measuring 340 mm where the sides are flaring out towards the rim. The diameter of the rim is 480 mm and the height of the basket is 470 mm. 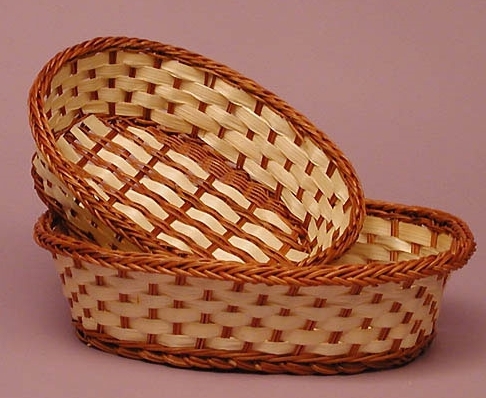 Twill pattern is used to weave the base of the basket. A variety of shallow carrying baskets can also be found. The Bengali community of Tripura used a basket called tukri. This basket has a square base and the sides tend to fare out in a sharp way to a huge circular rim. The rim diameter of a tukri is 390 mm and the diagonal of the square base is 220 mm. A tukri is 150 mm high. Laii is a tiny bamboo basket which is used by the Bengali community of Tripura for washing rice. The square base of laii measures 220 mm diagonally and its sides flare out to a circular rim with a diameter measuring 320 mm. the basket is 140 mm high. In order to form the base square of the basket, two sets of warp elements are interlaced where both are made from bamboo splits. Small baskets of various kinds meant for storage and many other purposes are also made of bamboo. Sempa khari is such a basket where small objects are stored. The square base of this kind of basket measures 160 mm diagonally and the vertical sides form a square rim. The basket has a height of 65 mm. the rough inner splits of bamboo are used for weaving. Date baskets meant for storing dates are also made of bamboo. Such a basket remains suspended from the waist band. It is woven from the coarse bamboo splits applying the diagonal weaving method. The basket looks like a deep rectangular pouch with its top open where the base is a straight line having the sides bulging out. Turi is a small basket used for storing puffed rice. Its diameter is 170 mm and height is 80 mm. the rim is strong since it is sandwiched between rings made of bamboo splits. Large storage baskets made of bamboo are generally used for storing grains. These have huge square base and the sides tend to taper out to a circular rim which is huge. Professional craftsmen make such baskets where cow dung, rice husk and clay are mixed and used as a plaster. Bamboo is used for making a variety of fish traps and fish baskets in Tripura. The Jamatia tribe uses the fish trap called sudha which is a net that remains suspended from splints that are crossed. The net is a bamboo mat rectangular in shape. The splints remain crossed at a 30- degree angle. Dulla is a fish basket having a square base and a narrow neck. Tripura excels in making low-height searing arrangements called mudah. Both bamboo and cane splits are used to make this comfortable and stylish native furniture. While in the body and the rim structure bamboo is used, split cane is used for binding the elements and the seat weave. The mudah gets is strength from the elaborate binding and its seat and the rim covering is woven in a decorative fashion. Kindly send your quote for bamboo baskets.